Can a Felon Get an Enhanced Driver’s License? By the time he or she is released, a felon’s driver’s license has usually expired, or the offense resulted in his or her license being revoked. It can be challenging to get a driver’s license again and be able to travel. 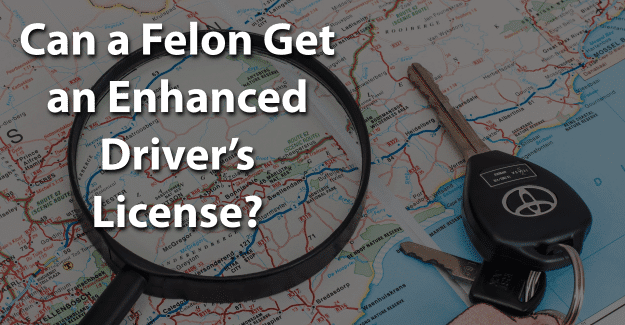 This blog post will address the issue of whether or not a felon can get an enhanced driver’s license. An EDL is accepted only for land and sea border crossings, not for air travel. A regular passport is needed when entering the U.S. by air. An enhanced driver’s license also contains a radio-frequency microchip that uniquely identifies a person in Customs and Border Protection (CBP) databases. An EDL is also in compliance with the new Western Hemisphere Travel Initiative (WHTI) security measures. The events of 9/11 signaled a major change in relationships between the U.S. and other countries. In an effort to strengthen border security and facilitate entry to this country for citizens and legitimate foreign visitors, the United States instituted the Western Hemisphere Travel Initiative. With this, all citizens of the United States, Canada, Mexico, and Bermuda are required to present a passport or other acceptable document to verify their identity and nationality to enter or leave the U.S. from within the Western Hemisphere. These offenses will result in a permanently-revoked license. Usually, for multiple DUI’s, the license can be re-established. There is a difference between a felony and misdemeanor DUI with several factors determining its severity level. First, is the BAC level at the time the offense is committed. With .08 established as the legal limit, the farther above that, the more likely it will be considered a felony. Another factor is how recklessly they were driving, which establishes a level of danger to their actions. Along with this is whether there were any injuries or deaths in the incident. The more injuries and the more serious those were, the more likely it is that the DUI charge will be a felony. A DUI with a minor in the vehicle will also result in a felony DUI. Driving with a suspended driver’s license will also earn a felony conviction. Also, felons previous criminal records make a difference. With previous felony convictions on their records, the more likely it is for that charge to be considered a felony. Each state has its own laws regarding DUI’s, including the criteria for a DUI to become a felony. Typically, a third DUI conviction will make those charges a felony. If a felon’s driver’s license is revoked for one of these offenses, he or she must attend a reinstatement hearing in person. Felons with a vehicular homicide offense are unlikely to get their license back. Felons will have to complete all court requirements. They will have to provide proof of car insurance and pay a court fee. Having legal counsel is recommended. If a felon’s license has been revoked for an alcohol- or drug-related offense, they must complete an approved substance abuse program and provide proof of completion. After that, they will have to complete an application in the state where they live. Then, they will have to pass a written knowledge test, a driving test, and a vision exam. The second criterion a felon must pass is getting a passport, which is a form of identification from the federal government allowing international travel. Being convicted of drug trafficking or a crime of treason against the U.S. may prevent felons from being able to obtain a passport, as well as for anyone owing a certain amount of child support. Having current legal charges pending can also prevent having a passport. This is because leaving the country will be interpreted as an unlawful attempt to avoid prosecution, which is itself a federal crime. Otherwise, a felon can get a passport after all aspects of his or her sentence are satisfied. It is important to be honest in filling out an application when applying for an enhanced driver’s license. If a felony isn’t disclosed but is found on a background check, this constitutes fraud and is punishable. It is a crime to falsify an application, which could result in being sent back to prison. In order to be successful in getting an enhanced driver’s license, it’s essential for felons to be honest about their background. They are already seen with negative perceptions of being dishonest, untrustworthy, and unwilling or unable to follow directions from authority figures. Having their record expunged can give them the chance needed to begin with a clean record and succeed in getting an enhanced driver’s license. Expunging a criminal record allows anyone to honestly state on an application that he or she has not been convicted of a crime. It is a big challenge, but it might be worth it for a felon wanting to get an enhanced driver’s license. Having his or her record expunged and also documenting any training programs or additional education could make the essential difference in a felon succeeding in getting an EDL. What do you think about this blog post? Have you or someone you know been in the situation of trying to get an enhanced driver’s license with a felony? What was that like for him or her, and how did he or she achieve success? Please tell us in the comments below.